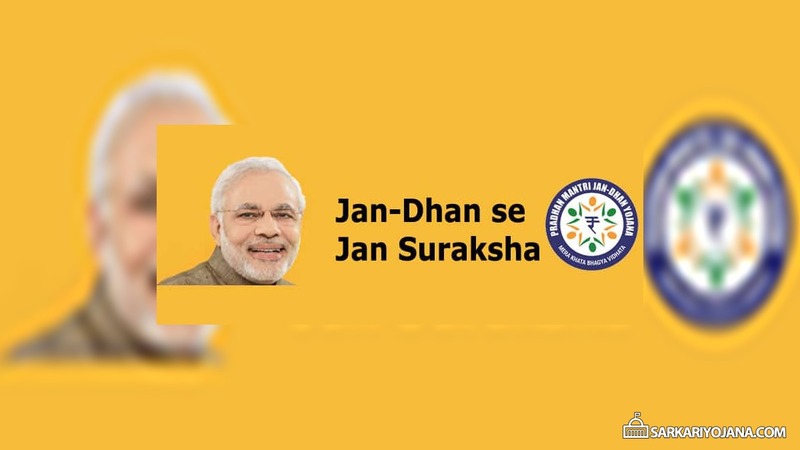 Pradhan Mantri Suraksha Bima Yojana (PMSBY), launched in May 2015, is a government backed accidental-death insurance scheme. As of May 2015, only 20% of India’s population has any kind of insurance and this scheme aims to increase this number. However, Suraksha Bima Yojana is available for all but was launched keeping in mind the people belong to the below poverty line category or under-privileged and those who are not able to afford any kind of insurance plans available with private or even public sector insurance companies. Suraksha Bima Yojana is for the people who are not covered under any kind of insurance scheme, especially in the rural areas of the country. In case accidental death or permanent disability or irrecoverable and total loss of both hands, both eyes or sight or one leg or foot, the insurance cover would be up to 2 Lakh. The sum assured would be Rs. 1 Lakh in case of partial disability or lost of one leg, hand, foot, eye or sight. The assured amount will be paid to the nominee. That is the biggest advantage of Suraksha Bima Yojana, even the poorest of the poor can also afford the premium of PM Suraksha Bima Yojana. The premium is Just Rs. 12 per year for each member. Once the insurance is availed, a sum of Rs. 12 will be auto debited from the saving bank account (with an auto-debit facility) of the policy holder. The auto-debit transaction will take place on or before 31st May for the coverage period 1st June to 31st May on an annual renewal basis. If the auto-debit of premium amount does not happen for some reasons on 1st of June, the insurance plan will be discontinued. The policy will automatically be renewed/re-initiated after the auto debit of the premium amount from the bank account. Below is the eligibility criteria for getting a policy under the PM Suraksha Bima Yojana. The age of the policy aspirant should be at least 18 year and no more than 70 years. The aspirant will have to sign a consent letter for the auto debit of policy premium. The scheme will be renewed every year with a single year cover at a time. It is offered by Public Sector General Insurance Companies or any other General Insurance Company who are willing to offer the product on similar terms with necessary approvals and tie up with banks for this purpose. The banks can engage any insurance company of their choice to offer the scheme. Only one policy will be allowed per person in case the person has more than one saving bank account. Aadhar card would be the mandatory and primary document required for getting registered under the scheme. The premium of the policy would be auto-debited every year from the saving bank account of the policy holder. On attaining the age of 70 years. Due to insufficiency of balance in the saving account at the time of policy renewal in subsequent years. In case the subscriber is found to be covered by more than one saving bank account and the premium is being paid intentionally. Only one policy cover will remain active and other will be terminated and premium paid will be forfeited. If the cover is terminated in cases such as technical or administrative reasons, or due date, the cover can be reinstated on receipt of full annual premium. A total of 124,770,760 people has been covered under the scheme by 09 February 2016. 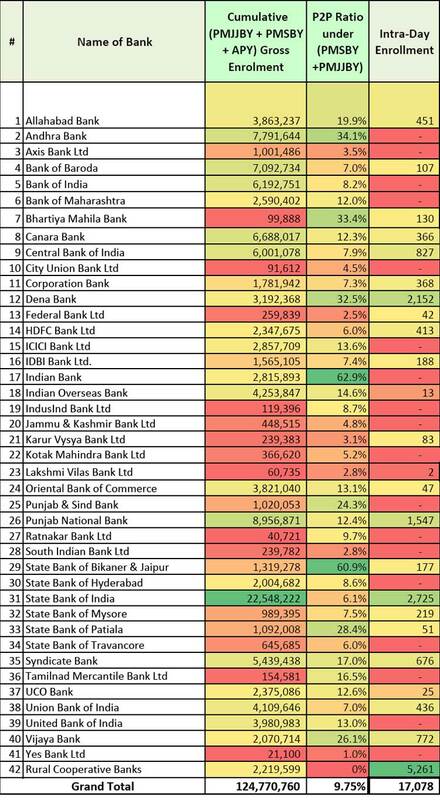 At present, there are 42 private and public sector banks participating in the scheme and below is the bank-wise result table of number of policies done by each bank, As of 9 February 2016.